Please help those that can't help themselves. Without YOU CAWL wouldn't exist--and neither would many wonderful animals. CAWL was established in 1992. Our facility has been in full operation since July of 2004. We are a limited no-kill intake facility with all volunteers, running our Adoption and Education Center. Even though we are only open for adoption 3 days a week, we still must feed, house and care for the animals 24 hrs a day, 365 days a year. We continue to need funds to operate and maintain the facility around the clock. With your continued financial help, the Calvert Animal Adoption and Education center will continue to save the lives of hundreds of dogs and cats every year. We receive no type of state or federal funding. We are totally dependent on the community to keep us going. CAWL is a 503(c)(3) non-profit. Please contact us if you wish to arrange for a legacy donation. 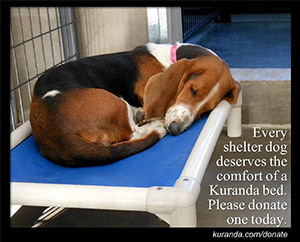 We have a special need right now for beds that we use in the kennels. Just follow the link by clicking on the image to the right. The following items are always needed. Thank you. It is CAWL's policy to not accept ANY products from China--including toys as well as food. This is for the safety of the animals and people. There have been instances of lead in animal toy products from China and obviously the food is of question. The new Maryland Pet License plate, featuring silhouettes of a dog and cat, which funds the Spay and Neuter discount plan, can be yours. CAWL, P.O. Box 1660, Prince Frederick, MD 20678. We will send you the application immediately, which you can in turn send to the Maryland MVA along with an additional $25 to obtain the "Spay and Neuter" plate. We also have an Amazon wish list that you can use to help. It's very easy for you to make donations by simply purchasing items from this wish list or other items from the left. If you have items that are in good condition, we will gladly accept them for sale in our Second Hand Shop. ​Open during regular adoption hours our volunteers are regularly turning over merchandise and re-decorating the shop for events. So be sure to join our regular shoppers and stop by to see what bargains you can pick up! ​100% of proceeds go directly to the shelter. Unfortunately we cannot accept the following items at this time: Clothing, Shoes, Books, Toys, Car Supplies, and computers or printers. What if CAWL earned a penny every time you searched the Internet? Well, now we can! ​GoodSearch.com is a search engine that donates half its revenue, about a penny per search, to the charities its users designate. You use it just as you would any search engine, and it’s powered by Yahoo!, so you get great results. Just go to GoodSearch.com and be sure to enter The Calvert Animal Welfare League as the charity you want to support. Just 500 of us searching four times a day will raise about $7300 in a year without anyone spending a dime! And, be sure to spread the word!